Marianne's work is simply incredible. She was able to take my wedding dress that was sitting in storage and design and construct my children's Christening outfits. Both of the outfits exceeded my expectations for creativity and craftsmanship. Further, Marianne is problem-solver. For example, I did not have enough dress fabric for Marianne to use for my son's outfit. After contacting Marianne with my concern, she was able to expertly match the fabric and integrated it into the final piece so my son's outfit could also incorporate pieces of my dress. Additionally, she was very accomodating and personable and completed all work on time at an extremely reasonable rate. I was so thankful to have found her. It is with highest accolades that I recommend Marianne for all your dress making needs. 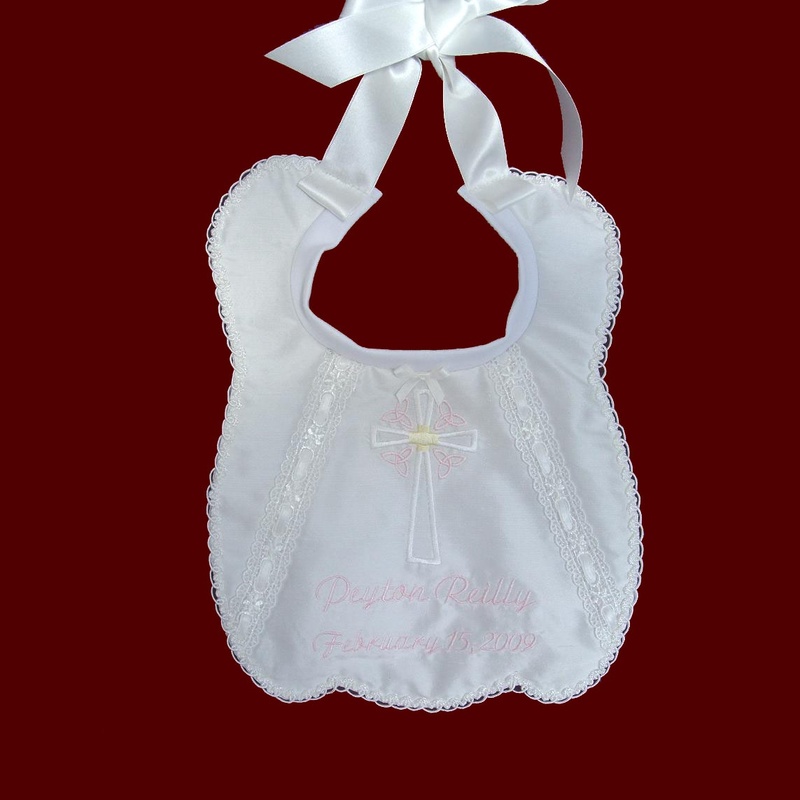 Complete baby's christening outfit with a special personalized bib designed with an embroidered Celtic cross with beading & swirled heart trim for girls (trims will vary depending on fabric chosen & availability) and piping for boys. Soft rib knit at the neckline along with satin ribbon ties and a bow with tiny shamrock applique. Bib is available in a variety of fabrics in white or ivory including shantung, silk dupione (shown), Irish linen, satin, cotton batiste and linen batiste. Trims may vary depending on fabric and color chosen. *New embroidered cross designs now available. Embroidery can be all white, all ivory or with pale pink or blue accents. Irish accents available.